Welcome to life, everybody! This is JuniorTennis7! 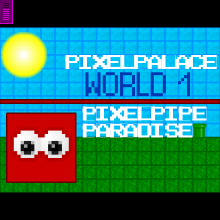 I've created the first world of the PixelPalace series, PixelPipe Paradise! PixelPipe Paradise is a world of green pixelated grass, moving pipes, and PixelOrbs. Collect PixelOrbs and go through the goal in order to complete the level. And to the few of you that are wondering, there are two reasons as to why I have not made this a full 9-level game. The first reason, is that not many people like playing games for that long. As you've probably realized, not many people have the patience to survive 9 difficult (yet epic) levels of JuniorTennis7's games. So I've shortened the gameplay down to 3 levels in order to allow more people to have fun with the game. And the second reason as to why I do not want to make a 9-level game is because I tire of making 9-level games. My Donkey Kong Country Returns series has 9-level games. Sonic Genesis has 9-level games. Fancy Pants does too. If you think about it, almost every single series in the past that I've made has been full of 9-level games. So I've decided to make this series full of shorter, 6-level games so that people can beat it faster and have more fun playing. Plus, if my games are slightly shorter, I can publish them more quickly, and people will be able to play new games more often on my channel. Sorry for the long description, but anyways, have fun playing this game!